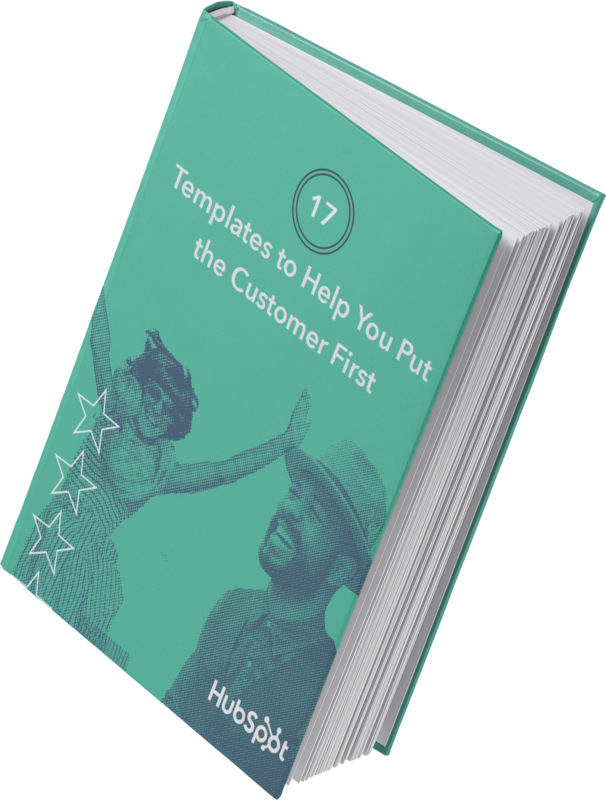 Learn about the importance of customer success, and learn how to help your customers help your business grow. Customers have never had more options — from toothpaste brands to business software. Humans have never had more demands for our attention — between Facebook, podcasts, Audible, and the latest Netflix show. Entrepreneurs have never found it so easy to create a new product or service to meet a niche demand. We've never seen such an explosion of information, options, and possibilities. This has put new pressure on businesses. Today, you need to have an exceptional sales team. You also need to have an exceptional marketing team. But sales and marketing alone aren't enough to sustain growth. Businesses can no longer rely on annual contracts to lock customers in, and the cost of customer acquisition has ticked up steadily over the past decade. Today, customer success is the biggest emerging growth opportunity in business. In this blog post, we'll dive into the following concepts. Use these chapter modules to jump ahead or keep reading to get started. 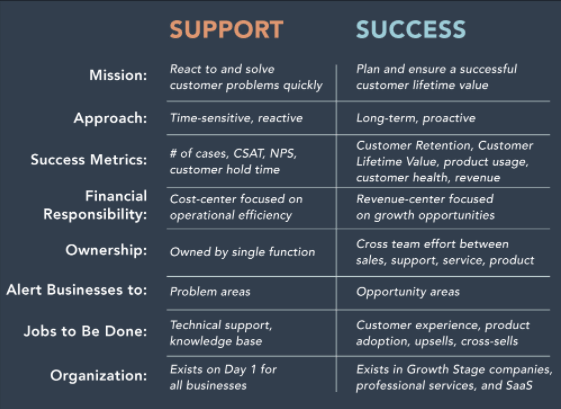 Customer success is an organizational function that helps customers get maximum value out of a product or service, while working closely with sales, marketing, and product to achieve that goal. Like sales and marketing, it is a revenue-generating team. Customer success provides proactive outreach aimed at increasing upsells and cross-sells, positive word-of-mouth, and successful outcomes for customers. Customer success aligns closely with customer support (at HubSpot, these teams sit together) to take customer satisfaction to the next level. Traditionally, sales and marketing were considered the growth levers businesses could control to grow revenues. But ignoring customers as a way to grow your business is a mistake. By focusing on your customers and their success with your product or service, you can retain customers longer and activate them as your advocates, and they'll refer you new customers through word-of-mouth. Sales was the first growth engine in business. Travel back in time to as recently as the turn of the 21st century, and sales was still the primary growth engine for B2B companies. Marketing didn't matter too much because salespeople owned the information flow. Marketing at this time was mostly buying email lists, printing the company logo on pens, and showing up at conferences. Service didn't matter too much because contracts, for software companies as well as professional services, acted as "lock-ins" on customer loyalty. You had to keep customers somewhat happy, but that would usually be achieved with a group of support people in a call center somewhere. Marketing was the second growth engine in business. Then, the internet opened up the gateway to information. As it turns out, if given a choice, prospects prefer to do their own research and don't want to talk to a salesperson until they're ready. A new opportunity opened up for businesses to attract prospective buyers much earlier in the buying process. Marketing teams started growing as companies hired people to write blog posts, manage lead generation campaigns, run online ads, and build followings on emerging social channels. You still needed salespeople, but the biggest barrier to growth wasn't the size of your sales team — it was the number of leads your marketing team could create for your sales team. And sure, you needed to keep customers happy, but contracts were still the norm that provided businesses with some protection. In addition, acquiring customers was intoxicatingly cheap, so why would companies overspend on retaining customers when it was so cheap to acquire new ones? Customer success is emerging as the third growth engine. Today, buyers are flooded with previously unimaginable choice. They have more options, more information, and more demands on their attention than ever before. The balance of power has shifted and buyers no longer have to put up with annual contracts. More and more software companies are shifting to freemium models that allow customers to try before they buy and cancel at any time. And buyers have started to tune out marketing. Globally, only 3% of people say they trust sales and marketing professionals (ouch!). The cost-per-click for ads is rising on every channel, people are tuning out marketing messages, and social giants like Facebook have become the gatekeeping bridge troll demanding payment to reach any audience at all (even an audience that has opted in to hear from you). When it becomes more expensive to acquire customers and easier for them to leave, something inevitable happens — businesses start paying a whole lot more attention to keeping existing customers very, very happy. You still need salespeople to close deals, and you still need a marketing team to supply them with leads. But for growing companies, the biggest barrier to that next level of growth isn't likely to be the size of your sales and marketing team, but rather, how good you are at stopping customer churn and building a base of happy, successful, outspoken advocates. 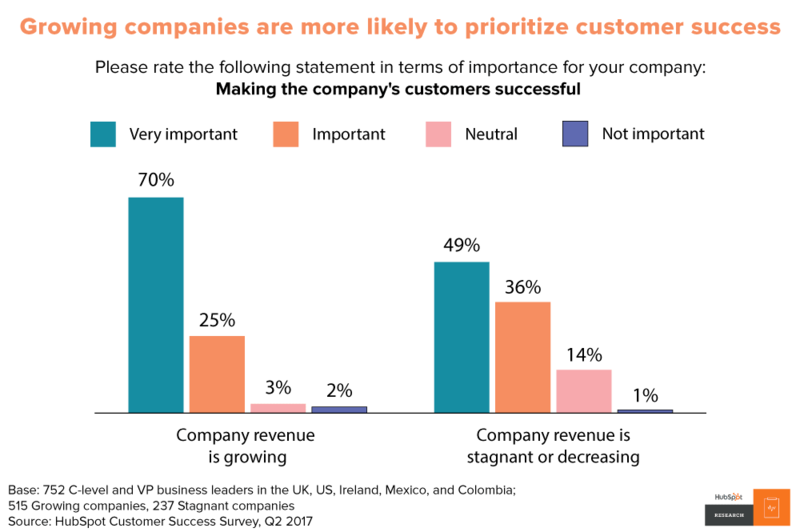 In our research, we found that growing companies are 21% more likely than their stagnant counterparts to say that making the company's customers successful is "very important." And it's not just because growing companies are so flush with cash they can afford to spend it however they please. In fact, growing companies are 33% more likely to report that running their business in a cost-efficient way is also very important. Growing businesses today get something very important: selling to less-than-ideal customers just to hit a number is not cost-efficient, spending money to acquire a customer that will churn in three months, is not cost-efficient. The most cost-efficient way to run a business today is ensuring that your customers are happy and successful — that takes customer success. The most cost-efficient way to run a business today is ensuring that your customers are happy and successful -- that takes customer success. Businesses have always known that successful customers are important, but traditionally that job has been passed off to customer support–a frequently under-funded team of people tasked with helping customers when they run into issues. Support is the function that solves problems when customers raise them; it's reactive fulfillment to specific customer requests. Customer support has existed for a long time as the single place for customers to go when they encounter a problem, and this team isn't going anywhere. But one of the most painful things about working in customer support is that these front-line people often see the same root cause surface again and again and again. They can solve the individual problem, but the organization is often unwilling to make the investment needed to find a systemic fix. That's where customer success starts to come in. Whether your business today has only customer support or customer success is not an indicator of how "customer-centric" you are. Amazon is one of the most customer-centric businesses out there and it's unlikely you've ever received an email from an Amazon Customer Success Manager. Many SaaS startups with low average contract value or exceptionally high volume, demonstrate their customer-focus by providing exceptional documentation, a rich knowledge base, or a thriving user community–no formal customer success team needed. But even in these teams, you'll see the appearance of "customer success thinking" — exceptional onboarding, recommendation bots, proactive support when things go wrong. You'll find that every successful business today, whether they have a formal team or not, is thinking about how to make their customers more successful, and there's a good reason for this, as I said at the beginning of this post, growth is getting harder.